Every once in a while I experience a culinary triumph. I’m happy to say that I have graduated from the “Pasta ala Mala” school of throwing together Ragu sauces and Starkist tuna and actually delved into being a little more desi in my cooking attempts. This came about because I had a bunch of jasmine rice in the cabinet from when my mom visited last year and a package of frozen vegetables when she visited a few months ago. I’ve been perfecting the recipe for a while and I think I’ve finally got it down. Mind you, this recipe is just a guideline. I like to think that it’s impossible for Indian home cooking to involve exact numbers. We’re very much a school of “just throw stuff in, and then throw MORE stuff in.” So, no matter what the amounts for the spices are below, just assume I kept randomly adding in more at various points in the process. LOL. A ten inch diameter nonstick frying pan. After a thorough rinse, soak rice in lukewarm water for ten minutes. While rice is soaking, heat oil in frying pan at medium heat. When the oil is hot enough, unwrap the frozen vegetables and jump back three feet to avoid being splattered. Let the veggies thaw, stirring occasionally to break apart the ice and ensure it cooks evenly. Add the turmeric and a 1/4 teaspoon of salt. (Make sure you don’t add too much turmeric. It’s solely for color and tastes very bitter.) Sautee! Once your veggies stop looking all frozen-y and raw and actually seem to be browning, drain your rice and dump it into the frying pan. 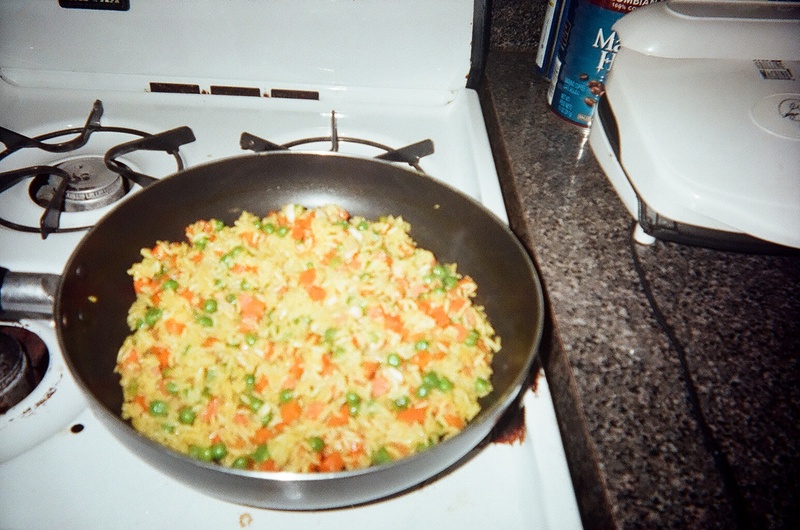 Add two parts water to how much ever rice you have and turn up the heat a little. Add the remainder of your spices and bring to a boil. Once the rice comes to a boil, reduce the temperature to a simmer and cook until all the water is absorbed. (If you’re like me and you taste as you go, you end up adding more ginger, more salt, etc.) Add peanuts and cranberries and stir until thoroughly mixed. I usually end up with enough for three meals. I pair it with George Foreman-ed chicken or steak (not very Indian of me, I know!) or eat it all by itself. Prep time: 20 minutes max!